Publish in Spirou's diary. 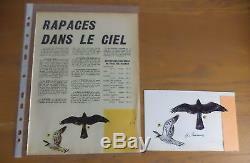 Superb original drawing two raptors published in the spirou journal late 1950 early 60, the publication is given to the buyer with the drawings, they were made in ink and watercolor and paste on sheet with cardboard to give this aspect, 11 x 18 cm slightly reduced in spirou, and especially signed by r. Hausman see pictures, port of 7 euro for Belgium. Attention to the purchase in my shop of an amount of more than 250 euro the port is free. Put your items on sale quickly and easily, and manage your ads in progress. The item "original watercolor drawing published in R. Hausman spirou" is on sale since Wednesday, August 13, 2014. It is in the category "books, comics, magazines \ bd \ boards, original drawings". The seller is "nicole6347" and is located in / in herve. This item can be delivered anywhere in the world.